Israeli soldiers abducted, on Wednesday at dawn, nine Palestinians from their homes in several communities in the governorates of Nablus and Tulkarem, and stormed homes of two detainees near Jenin, in northern West Bank. 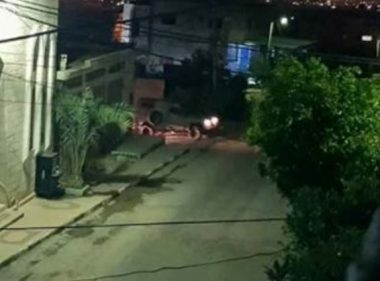 In Nablus, the soldiers invaded the Sawiya village, south of the city, and abducted Ateyyani Yousef Ateyyani and Sami Yasser Shahin, both in their twenties. The soldiers also abducted Abada Mohammad Jouda, 23, from Qabalan town, and Yassin ‘Aabed Sabah, 19, from ‘Orif village, in addition to Anas Sa’ad Awwad, in his thirties, from Awarta village. Furthermore, the soldiers invaded and searched many homes in ‘Allar town, north of Tulkarem, and abducted As’ad ‘Ameed Ja’ar, Ibrahim Tawfiq Jeebat, Shadi Bassem Ja’arna and Mo’men Zakariya Eneini. In related news, the soldiers invaded two homes in Qabatia town, south of Jenin and interrogated the families while ransacking their properties. The invaded homes are owned by a political prisoner, identified as Ibrahim Hussein Sweity, and Miqsim Abdullah Abu ar-Rob.